Recently, I’ve been working with a lot of students on a heel-up technique for playing two notes in a row–quickly–with a single bass drum pedal. This technique is an essential skill and will enable you to play a lot of great grooves as well as fills that incorporate the bass drum. In this post, I’ll address this technique in two ways, 1) describing the mechanics of the technique I recommend, and 2) providing you with a written exercise sheet as a PDF (“9 Exercises To Build Bass Drum Double Strokes”), that you can download and print out and use to give some structure to how you practice developing the technique. Please note that this is a heel-up technique. 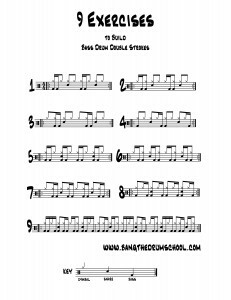 For quiet double strokes with the bass drum (ie for jazz or any other time when quieter playing is required) a heel-down method is preferable, but that is not addressed in this article. Front-Back refers to the mechanics of the motion, which require one to push down with the front of the ball of the foot, followed by the second stroke created by rocking the foot backwards and then pushing through the back of the ball of the foot. At fast tempos, the foot does actually “Slide” up the foot board. However, the essence of the technique comes from the “Rocking” or “Front-Back” motion, and that the “Slide” is a RESULT of those motions. This is why I don’t really like to call the technique “The Slide”—the implication is that sliding is the essence of the motion, and it is not. Sliding is a result of the correct motion, not the cause of it. Let me describe the mechanics in more detail. In heel up technique, the ball of the foot remains on the pedal board, and I like to have my foot situated down the pedal board (ie. towards me) a bit. The toes are not pushed all the up the pedal so that they are almost touching the head of the drum. On modern DW pedals, one way to look at this is that the toes are located just at the bottom edge of the DW logo. Here are the mechanics. I lift my heel up by engaging my thigh muscles. The front of my foot stays on the pedal. I push down through the front of the ball of my foot to get the first stroke and let the beater bounce off of the bass drum head. As the beater is coming back towards me, I rock my foot back, in a scooping kind of motion, so that my heel is now moving down towards the pedal, and the back of the ball of foot now pushes through to get me another bass drum stroke. When I get up to faster tempos doing this, the foot slides up the pedal as a result of the front-back/rocking motion. Before you open up the PDF, “9 Exercises,” let’s talk about some ways you can structure your practice to focus on mastering this technique. You can play any beat that you like that has two bass drum notes right next to each other and try to apply this technique to those patterns. But before even trying that, you might simply put down your sticks and try to maneuver through the foot technique with no music in mind, no patterns in mind, nothing but the technique itself. Work on it in isolation until it starts to feel right. Then, once you think you have a handle on the physicality of the movements, then and only then, you should start on some applications, and these exercises could be among them. Have at it. Comments, sharing and discussion are welcomed.